Wearing false lashes on your wedding day has become very popular with brides and it can be a great way to really pump up the volume on the glamour front. However the many different choices on the market can be quite confusing, so I thought I’d break down the different options here and offer a few of my hints and tips to help you make an informed choice. What are the different types of false lashes? These are strips of lashes which are applied directly along the entire length of the eyelid with special eyelash glue that dries hard on the eyelid and lashes. They come in a variety of lengths and designs and can create a lovely fullness to the lashes which are perfect for a bride or a special night out. I wouldn’t recommend wearing full strip false lashes on your wedding day unless you are used to them as they can make your eyes feel a little heavy, which on an important day such as your wedding may end up being something you regret. My personal favourites are: the Ardell Demi Wispies which are really natural & lightweight. Individual lashes or groups (clusters) of false lashes are applied directly to the eyelid with special eyelash glue to areas which are sparse, or at the outer part of the eyelid to achieve a particular effect. These can be a good option for a bride who hasn’t worn full strips before and would like to look a natural but have a little bit more length or fullness. They are so lightweight you will hardly notice them. Not to be confused with the traditional false eyelashes 1:1 lash extensions are applied with a strong lash glue to the lash only. Neither the extension lash or glue touches the eyelid. The bond is designed to last until the natural lash has finished its cycle and both the natural lash and extensions will fall out together. Although if one uses oil based products on the lashes or rubs their eyes regularly the extensions may fall out faster. These need to be filled within 3 weeks and professionally removed. Great for six weeks of extra glamour and perfect for your wedding day & honeymoon. These work with your own lashes to lift them and make them appear longer. The process involves “lifting” your own natural lashes from the base. The LVL Lash Lift gives you a beautiful wide awake look, with the illusion of an increase in lash length and thickness. The treatment takes 45 mins and will last up to 6 weeks with very little maintenance. Your lashes can also be tinted at the same time to give lashes an even more darker sultry look. Russian volume is a method that puts 2-6 very thin and light lash extensions on each one of your natural lashes. This technique (also known as Russian Layering, Russian Lashes and 3D-6D lashes) originated in Russia and has recently made a breakthrough in the US and Europe. This multi-lash technique involves adhering synthetic, ultra-fine lashes onto a single natural lash. The main benefit of Russian Layering is that it gives clients a full, high impact glamorous look with maximum natural looking volume. Finally if you really do want to keep things natural, and simply want to accelerate the growth of your own natural lashes, you should check out CReaTeLashes eyelash (& eyebrow) serum. 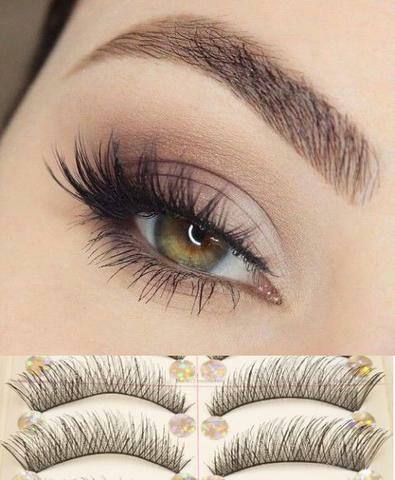 Eyelashes become fuller and longer whilst making them a shade darker. The active ingredient in CReaTeLashes eyelash & eyebrow serum is myristoyl pentapeptide 17. This innovating natural multi-protein complex stimulates the hair roots, lengthens the growth phase and slows down hair loss. The result is fuller, longer and stronger eyelashes and eyebrows. Makeup Artist Harrogate – contact Mel England Makeup for more advice about how to use false lashes or about any other makeup query. Mel specialises in Bridal Makeup & Makeup Lessons.